Compound Editions is very pleased to announce the release of our second multiple, All Your Eggs, by Vermont-based sculptor Andy Yoder. Known for his sculptures of everyday objects made from unexpected materials that trigger childhood memories, tweak well-known metaphors, and offer a very American critique of social values, Yoder here combines a series of popular financial aphorisms into one fantastic piece of jumbled advice. 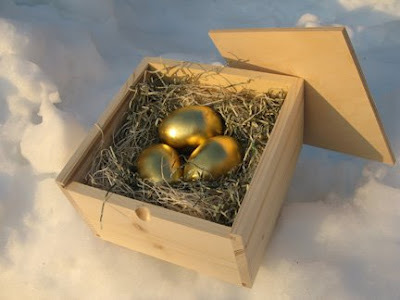 Resting in a nest of shredded US currency, these gorgeous gold-gilded eggs hidden in a humble wooden case reference a series of folksy epigrams, from "Protect your nest egg" to "Don't kill the goose that lays the golden egg," from "Put something away for a rainy day," to "Don't put all your eggs in one basket." Solid advice in any economic climate, but particularly good to remember in these challenging times. 4.25" x 7.25" x 7.25"
Edtion of 100, plus 10 APs.